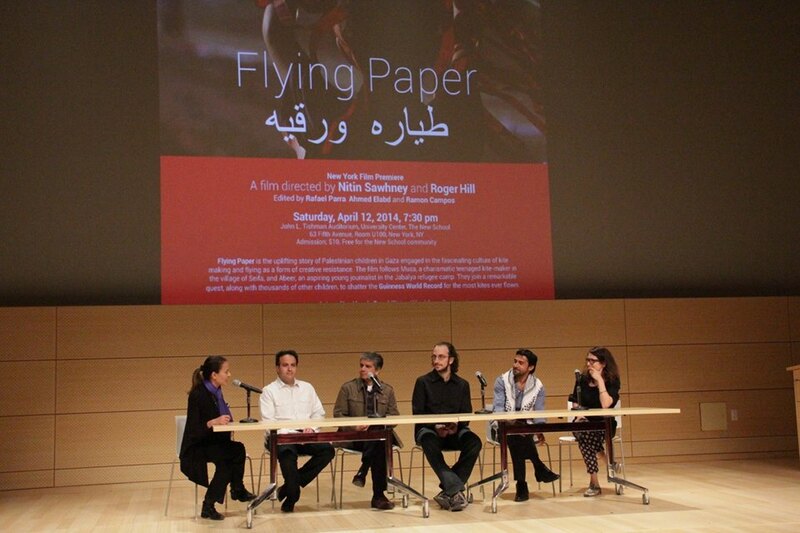 The Flying Paper New York Film Premiere was held on Saturday, April 12, 2014, 7:30 pm to 9:30 pm at the John L. Tishman Auditorium, University Center in The New School. This event showcased the New York City Premiere of the documentary film Flying Paper, co-directed by Nitin Sawhney and Roger Hill. The film has been over 4 years in the making, with HD post-production of the new 52 min broadcast cut of the film just being completed. The award-winning film has been screened in over 20 international film festivals and is being prepared for wider public release this year. The event included a premiere of the new short film Xik Vuh / Ala de Papel (Flying Wing) directed by Edgar Sajcabun and the Kamin art collective in Guatemala (12 mins in duration). The presentations also included a Tribute to Palestinian Cinema by Nitin Sawhney and introduction to the film by Roger Hill. Finally, a panel discussion and audience Q&A was hosted by Melissa Friedling which included filmmakers Nitin, Roger, editor Rafael Parra and invited filmmakers Mona Eldaief and Sameh Zoabi. A reception with Palestinian food from Tanoreen was held in the lobby of 2W 13th St. after the screening. Videos courtesy of Rebecca Scheckman and Lily Nguyen, RED Dog Productions at the School of Media Studies, The New School.